Very Reverend Michael M. Walters, J.C.L., V.F. Building on the family connection, the Diocese of Albany connects the Catskill and Adir­ondack mountain ranges. From a theological perspective, mountains have always been a special place of encounter with God; in the Old Testament, Mount Sinai was where Moses received the Law, and in the New Testament, Mount Tabor was the mount of the Transfiguration where Jesus revealed his glory. The Church is the third and central mountain which unites the faith and witness of both the Old and New Covenants. The mountains are green, the color of hope, symbolizing the abundant life available through faith. 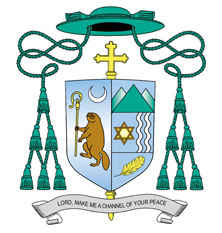 In the center portion of the shield, there is a Star of David, representing the bishop’s mother who was given the name Miriam at her baptism. The family, of Jewish origin, began in Kiev, Ukraine, and eventually moved to Dubuque, Iowa. Significantly, Kiev and Dubuque are both built alongside a river, as are Albany and Brooklyn. To the viewer’s right, there are two white wavy lines with a blue line in the middle, a traditional way to depict water. These represent the rivers of the bishop’s life: the Dnieper; the Mississippi; the Hudson; the Mohawk; and the East Rivers. All flow into the sea, as all life flows into the Kingdom of God. In the base of the shield is a gold feather, a reminder of the Holy Spirit and a connection to the Native American tribes of the Albany area, especially St. Kateri Tekakwitha, the Lily of the Mohawks. The feather has a long symbolic history going back to ancient Egypt, where the feather of Maat was the feather of truth and righteousness, which often tipped the balance between salvation and condemnation. Finally, the shield is complemented by the episcopal hat and cross and the scroll bearing the motto. The gallero was once the ordinary headgear of clerics. The color and number of tassels indicate the rank of the wearer. The color for bishops is green and has six tassels on each side. The cross behind the shield is a processional cross usually carried before the bishop in Church worship services. Bishop Scharfenberger’s motto, “Lord, make me a channel of your peace,” is taken from the prayer often attributed to St. Francis of Assisi. Design and commentary by Very Reverend Michael M. Walters, J.C.L., V.F., director, Pontifical Mission Societies, Archdiocese of Newark, N.J.; Art work by Sister Gerarda Panek, O.P., Caldwell College, N.J.